The position of the object. The directions of the object. The collision box dimensions of the object. The scale of the 3D model. The texture on the 3D model. sprite always rotated towards the player. If checked lights have no effect on the object. height of the blocking object is less or equal to step height. If checked the enemy follows the player. Specifies how fast the enemy follows the player. Life energy of the enemy. Specifies how accurate the enemy is when shooting at the player. 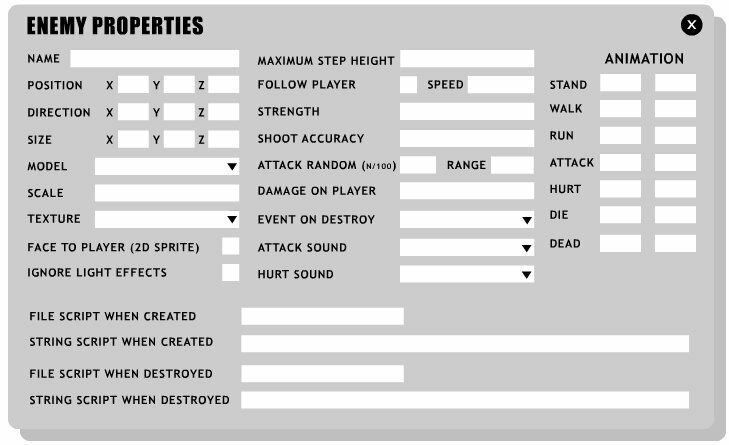 Specifies how often the enemy attacks the player. Specifies the range of the attack. range, the enemy can hit the player. Specifies how much life energy the player will loose when hit by the enemy. Sound played when the enemy attacks. Sound played when the enemy is hit by the player. Specifies the start and end frames of each sequence. The filename or the command string of different events.